Hey guys! Happy Hump Day! Who else beside me is is SOOOO excited for these Brazils??? I've been waiting FOREVER for these to come out and they are finally here! I'm breaking up my posts on this collection into 3 parts: The Brights, The Nudes, and the Sands. 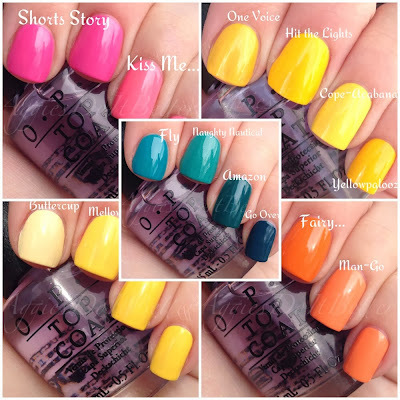 Each one will have some nail art also using those colors! I don't have the entire collection..... I purchased these myself so I had to think long and hard about which ones I really wanted. I decided to skip out on the red, the coral-y red, the darker orange, and the purple-y shimmer. (like how technical I am?) The ones I chose are truly unique in my collection, plus I love them so much. Even more now that I've worn them! They are all cremes....and apply like a DREAM. What we've come to know and expect from OPI. I also wanted to include some quick comparisons in these posts. I don't have a ginormous amount of polish, but I do sorta have a lot of OPI, so I started there. I just love seeing and reading comparisons others do so I really wanted to do some myself in my own way. By having them with the swatches you can keep your brain on the right color track. Here we go! This is Kiss Me I'm Brazilian. This is such a pretty pink, and it really feels neon to me. I'm not sure it comes off the way in the pics though. Just beautiful. 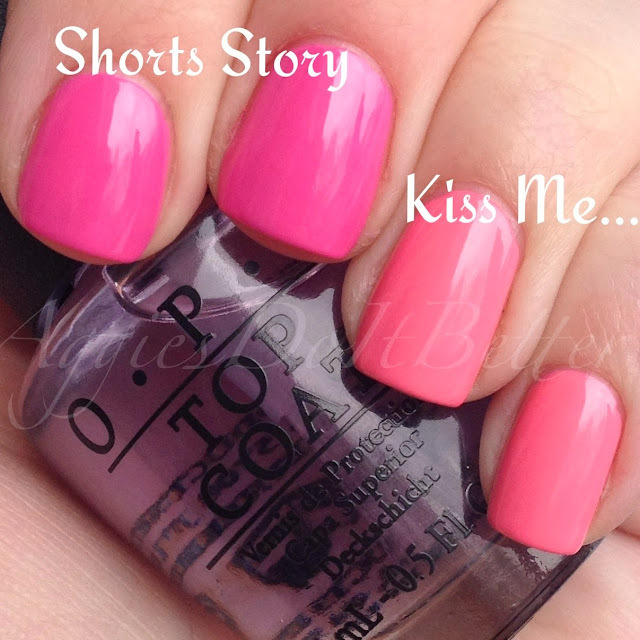 Pink comparisons: OPI Shorts Story is the closest I came. Kind of surprising given the amount of pinks I have :) These looked much closer in the bottle. This is Where did Suzi's Man-go? This collection has some seriously hilarious names. This one fits the bill. 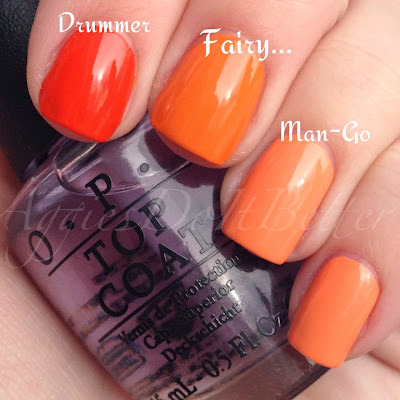 NEWSFLASH: I barely have any orange polishes, so not many to compare to. I almost didn't get this but I'm so glad I did. So creamy and peachy. Errrrr, mango-y. Comparisons: The darkest is from the mini OPI Halloween 2013 set, called The Drummer is Hot. 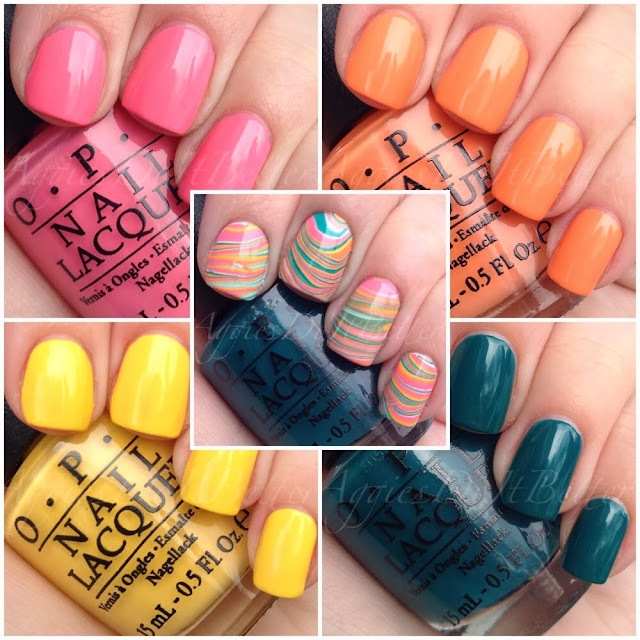 Next to that is Nicole by OPI Fairy Fairy Quite Contrary. 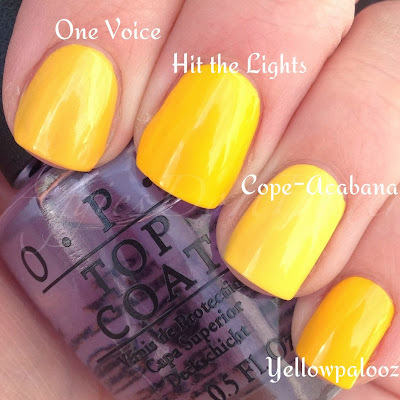 Next is I Just Can't Cope-Acabana. Hilarious and perfect name. So Beautiful . This is my new go-to yellow!! I don't have many yellows either so this was a must. I only compared it with a few, the rest were way too bright. 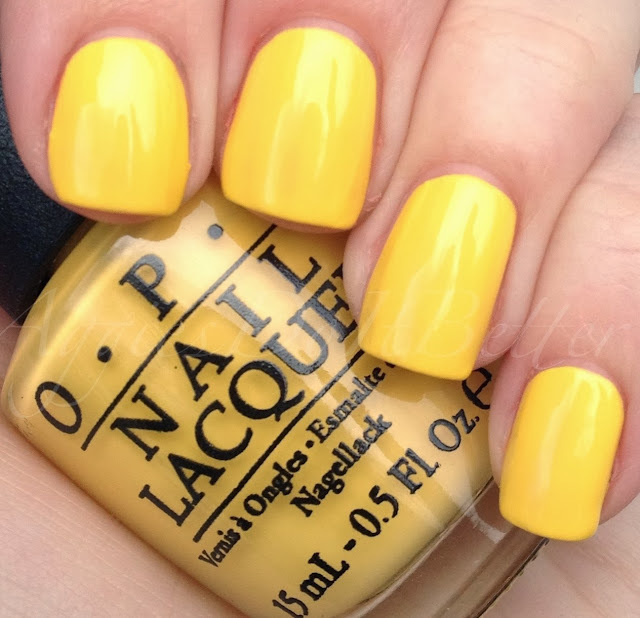 I don't own OPI Need Sunglasses so no comparison there :( First is Revlon Colorstay in Buttercup, then Sally Hanson X-Treme Wear in Mellow Yellow. Oooooooo that one comes close. But loses big time on formula. And last but DEFINITELY not least, mine and everyone else's favorite. I mean. GAH. I just love colors like this. I've read it's a stainer, so I just went exxxxxtraaaaaa slow and made sure not to get any on my skin. Here's a shocker: I have a ton of blues, teals, blue-greens, and green-blues. Like, a ton. BUT I was really surprised I didn't have more of a match for this. I used: OPI Fly, Essie Naughty Nautical, and Essie Go Overboard. I don't own OPI Ski Teal We Drop (boo!) but it seems to be very close to Go Overboard. 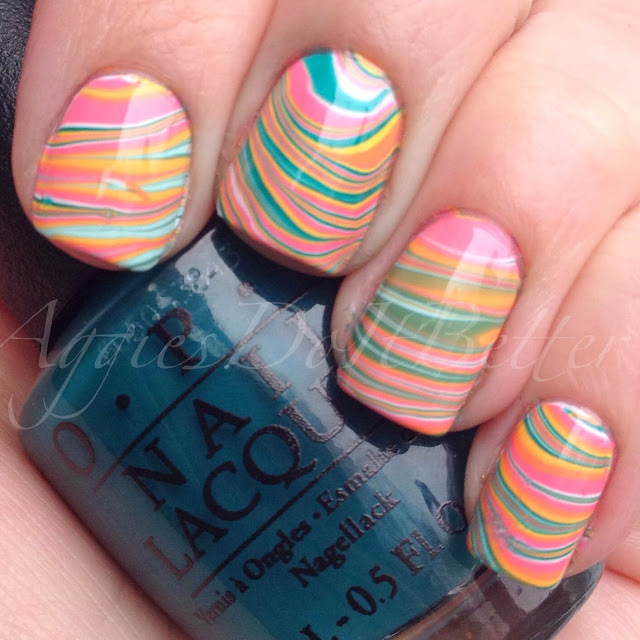 Here's a linear watermarble I did with my 4 colors over a white base. I'm still trying to practice my watermarble skills and this is my first time doing it this way (as opposed to floral). I like it! Just found you on Instagram. Wow, great swatches and bottle holding skills!! !